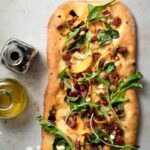 If you’re a pizza lover, this homemade rosemary thyme pizza dough recipe is going to rock your world! 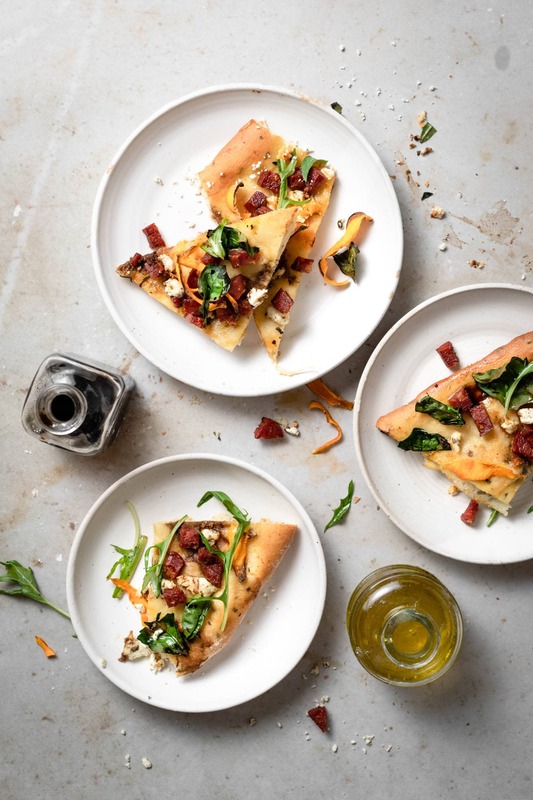 There is no need to eat greasy delivery or preserved frozen pizza, when fresh dough is so easy to make. 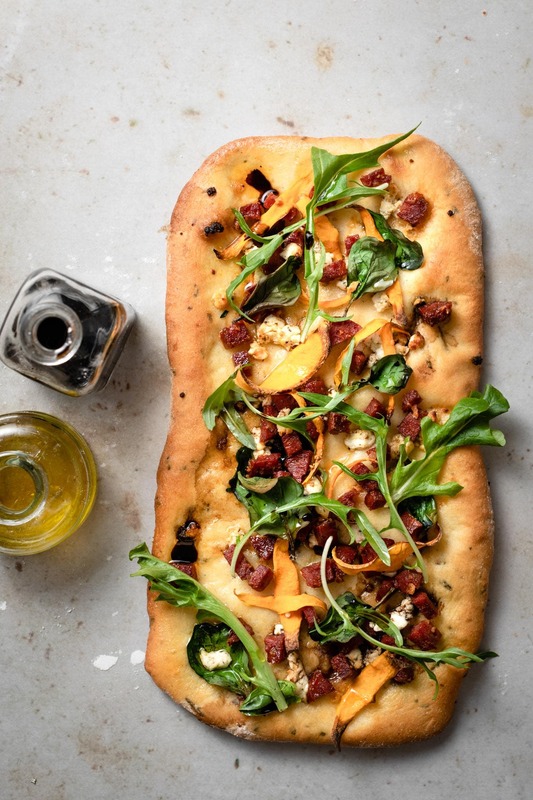 All you need is about 10 minutes of effort, two hours to watch a movie or walk your dog, and some fresh toppings to bake a flatbread. 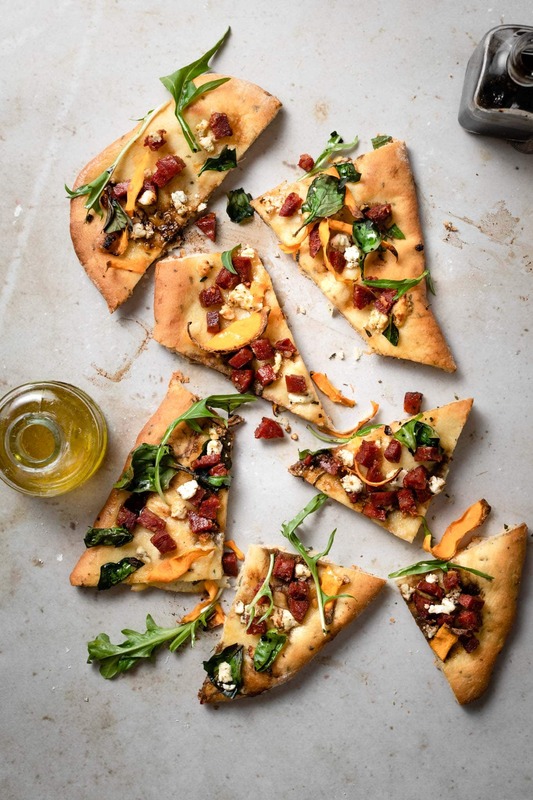 I prefer a thin to hand tossed crust thickness with a bit of a crunchy edge, but still chewy. Does that make sense?! Basically I don’t want to eat a cracker, nor a super doughy pizza. Pick the right type of flour! For this recipe I’m using a mixture of Semolina Flour and Bread Flour. Make sure to prove your dough. Choose between a 2 hr rise in a warm location or an overnight rise in the fridge. Roll the dough into a 1/4-1/2 inch thickness. Pre-bake the rolled out crust for about 10 minutes before adding toppings. 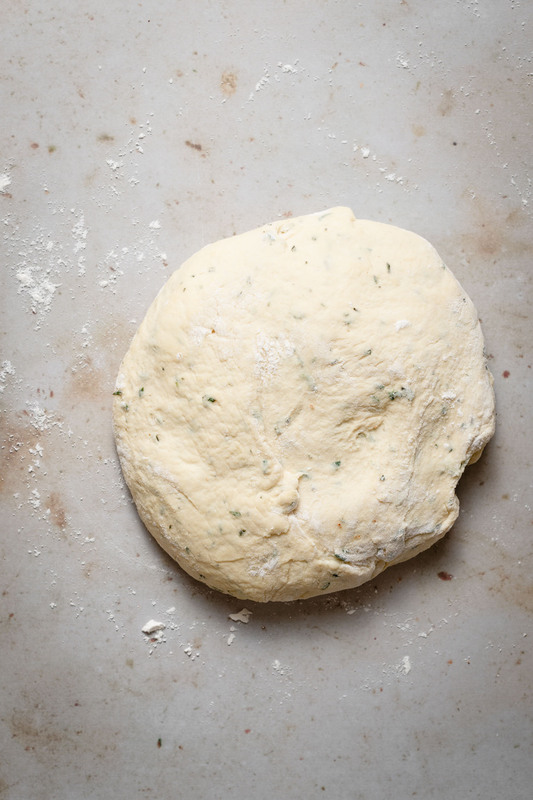 Make your pizza dough a couple hours before you’re ready to actually bake a pizza. Or prepare the dough the night before and stick in the fridge. ( Place dough in a bowl covered in plastic wrap, with plenty of room to double in size.) Don’t leave your dough in the fridge to prove longer than 24 hrs. An overnight prove, about 8 hrs will add more flavor depth to the crust, but not required. To prepare the yeast, check the temp of your water to be no warmer that 110 F. If it’s too hot for your finger it will kill the yeast. Once the yeast is “frothy” turn on the mixer, add the olive oil, and start spooning in your flour mixture. Medium low at first and then increase to medium. The dough will begin to take shape and pull away from the sides of the bowl. It should cling to the dough hook. Pizza dough should be tacky, but not super wet and sticky. If you find your dough to be too wet, simply add a Tbsp at a time of Bread Flour until its just barely grips your finger. Now, you can either turn up the mixer and beat on medium high for 3-4 minutes or place on a lightly floured surface and knead with your hands. Transfer dough to a lightly floured bowl, cover with plastic wrap, and set in a warm draft free place to rise. Use a bowl big enough for the dough to grow. Let dough sit for 1.5-2 hrs until doubled. This is also where you can opt for a slow cold rise in the fridge for 8 hrs. Scrape risen dough into a lightly floured surface. Dough should be filled with air and as you pull it from the bowl resemble a cheesecloth texture. Flatten dough with your hands removing an excess air. Roll out dough to 1/4 -1/2 inch thickness. Place on parchment paper lined baking tray. Poke a couple holes on dough to prevent too much lift. Bake at 450 F for 10 minutes. Remove from oven and add toppings of choice. Bake again for additional 10-15 minutes. You can bake the dough and toppings all at once, but I found a short pre bake to result in a crispier crust. 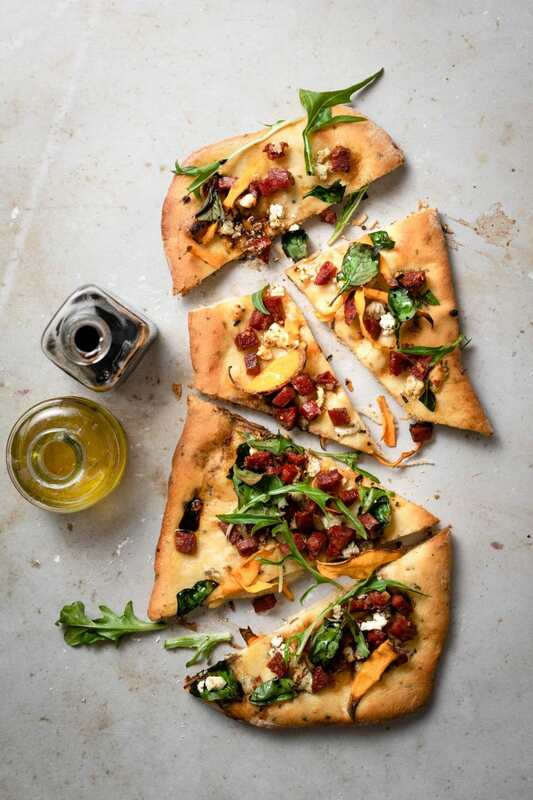 topped with arugula, then drizzled with olive oil and balsamic vinegar. Homemade Rosemary Thyme Pizza Dough Recipe made with Bread Flour and Semolina Flour. Easy homemade dough for pizzas and flatbreads. In a medium bowl hand whisk together semolina flour, bread flour, herbs and salt. Combine yeast, sugar, and warm water in the bowl of a stand mixer. Give a gentle stir and let sit for 10 minutes until frothy. Using the hook attachment, turn mixer onto medium low speed. Add olive oil, and slowly spoon flour mixture into yeast mixture. Once incorporated turn mixer up to medium high until dough is formed. Dough should pull away from sides of bowl and cling to dough hook. It should be tacky but not overly sticky. Beat on medium high for 3-4 minutes or hand knead on lightly floured surface for 4-5 minutes. Transfer dough to a lightly floured bowl, cover with plastic wrap. Set bowl in a draft free warm location until dough has doubled in size. Or place bowl in fridge for a slow cool rise for 8 hrs. When ready to use dough, press excess air out with hands. Roll or shape into desired form.